Today I want to review the Andycine A6 field monitor (also sold as Feelworld F6). I think this is the best budget monitor right now. I use this external camera monitor because my Sony camera does not have a flip out screen so I could not see myself otherwise. It is easier to judge focus because the image is bigger and I use it on a gimbal. Read on to see why I recommend it. Many cameras (esp. the 4k cameras) do not have a flip out screen. This is quite annoying if you want to film yourself. 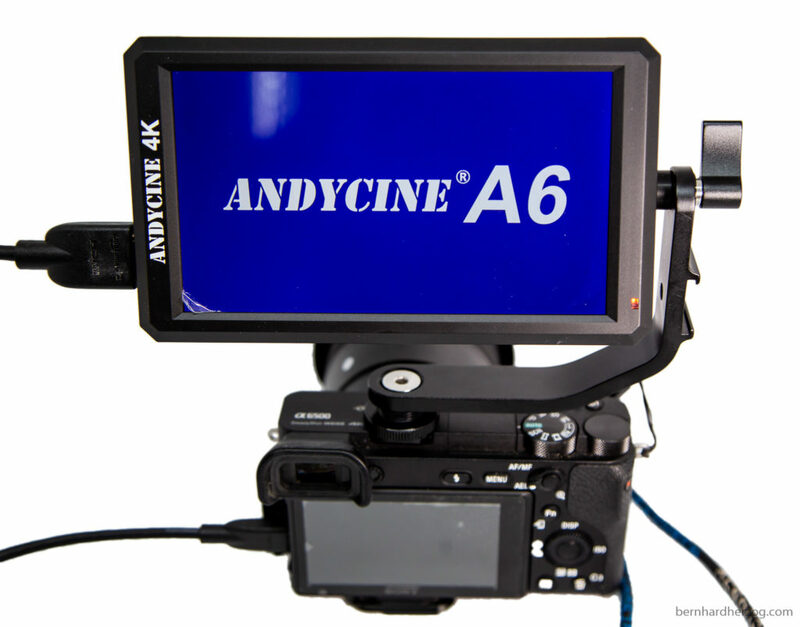 The Andycine A6 has a bracket to flip the screen around so that you can see yourself. 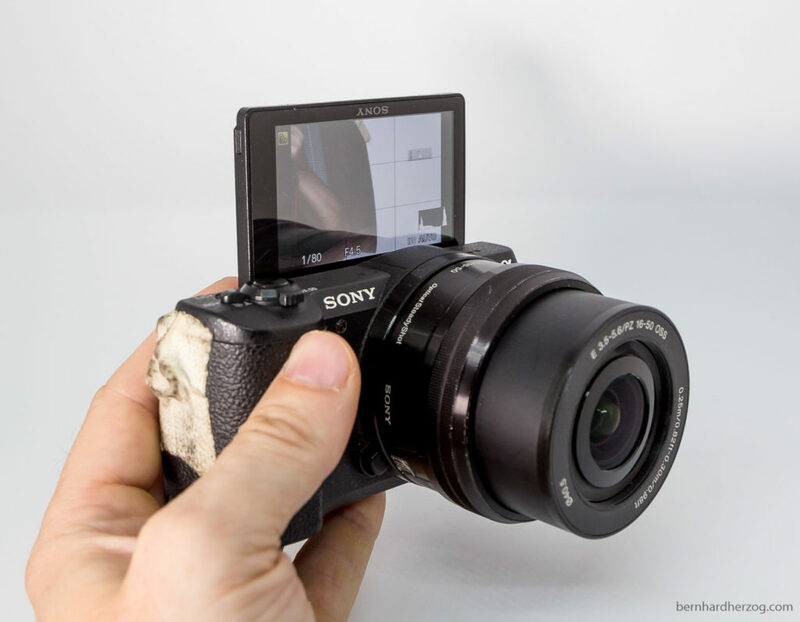 Sony cameras can film in 4k but then the screen dims (has been fixed with the A7III and A9, but is still a problem with the a6500 and a6300). Also camera screens are hard to see in direct sunlight. 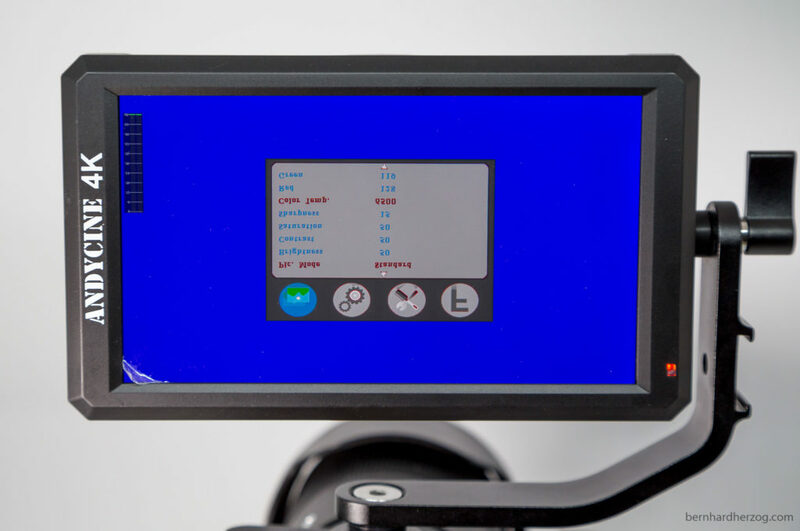 The screen of the field monitor is very bright and a sunshade can be mounted when filming outside in daylight. Because the screen of the camera is small it is hard to see what is in focus. 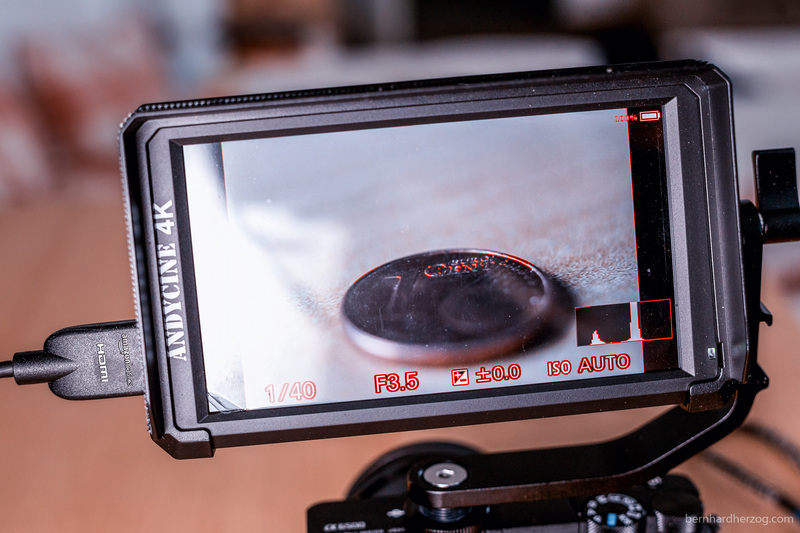 The Andycine A6 is very sharp (Full HD) and with the focus peaking feature it is quite easy to see what is in focus. This is esp. 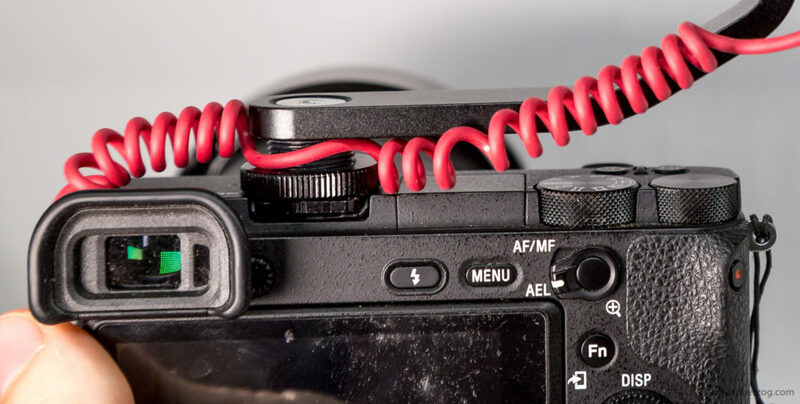 useful when using manual focus lenses when the area in focus is very small. Like with macro photography. 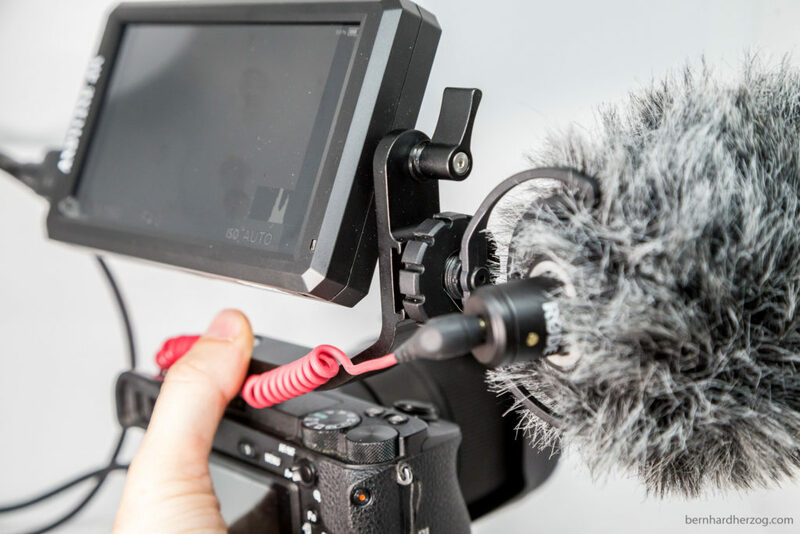 When using a gimbal the screen of the camera is obstructed (depending on the design of the gimbal). Using an external monitor you can more easily frame the shot and check the focus. The monitor is very similar to the Small HD Focus at a much lower price point. It also has a bracket so that it can be turned around to film yourself. But the screen is not a touchscreen and also the picture does not flip automatically. There are four function buttons on the top. The focus assist is very handy to see what is in focus. The false colors I have not really found a use for it until now. It is basically to see the distribution of highlights and shadows in the picture. The image flip is very important if you want to flip the monitor around. The zoom function is nice to zoom into the picture but it does not work in 4k. Other functions of note: Histogram, Over exposure warning and ratio marker (when you want to add black bars to your video later) and audio meter. The audio meter is very important because you also have the option to attach a headphone to the monitor to check your audio. You can see on the monitor if your audio is peeking. This was added with a recent firmware. If you buy this monitor you should have at least firmware version V5.41P (check on the second page in the menu). Note that even though this monitor has a USB port for firmware upgrades, there is no firmware software available to download. Supposedly this feature is only for the manufacturers to put the firmware on the device. 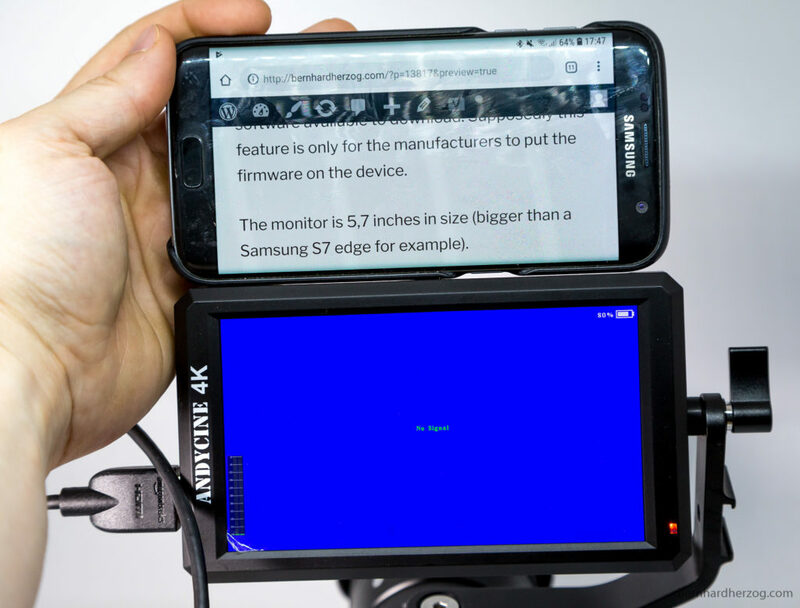 The monitor is 5,7 inches in size (bigger than a Samsung S7 edge for example). There is a mount for a microphone on the side of the bracket. 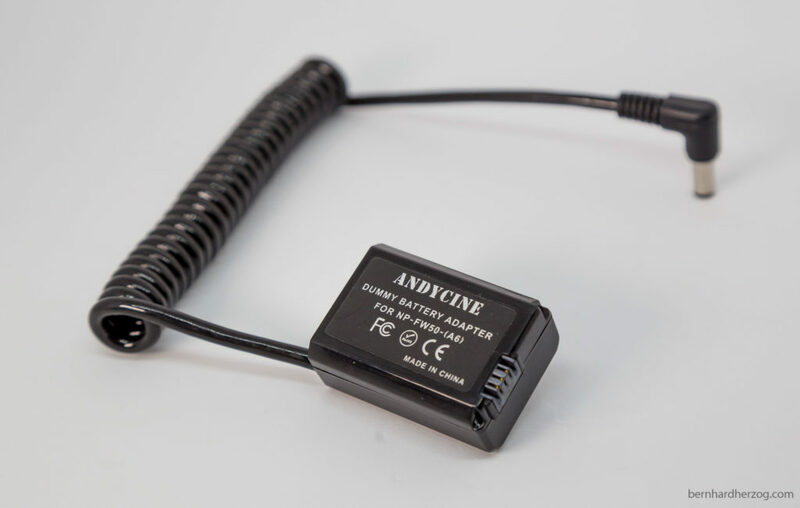 Most monitors use Sony NP-Fxxx-style batteries. 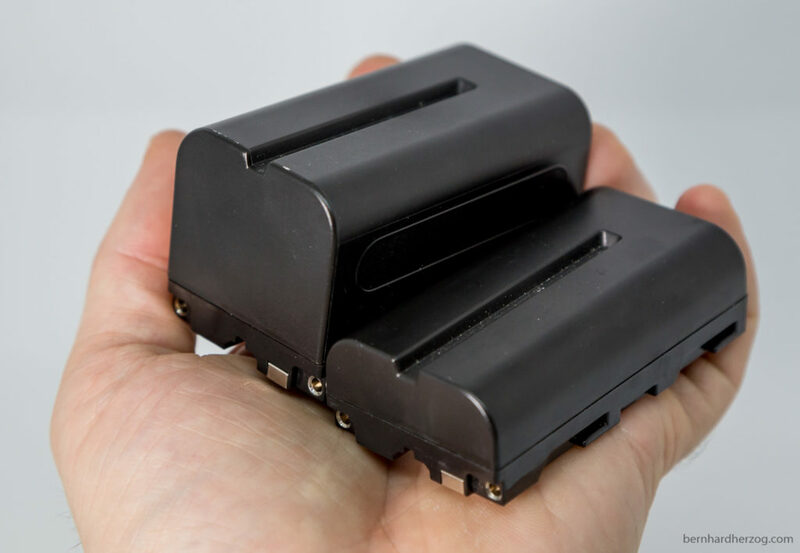 Those batteries are used on a wide range of devices including field monitors and LED lights. They are available in 3 sizes, the NP-F550, the NP-F950 and NP-F970. I bought 2 medium sized batteries (NP-F950) because I already had 2 small ones (NP-F550). I can recommend the batteries from DSTE. They are a very good value. When I bought the monitor it did not include a micro HDMI cable for my Sony camera, just a mini HDMI cable. 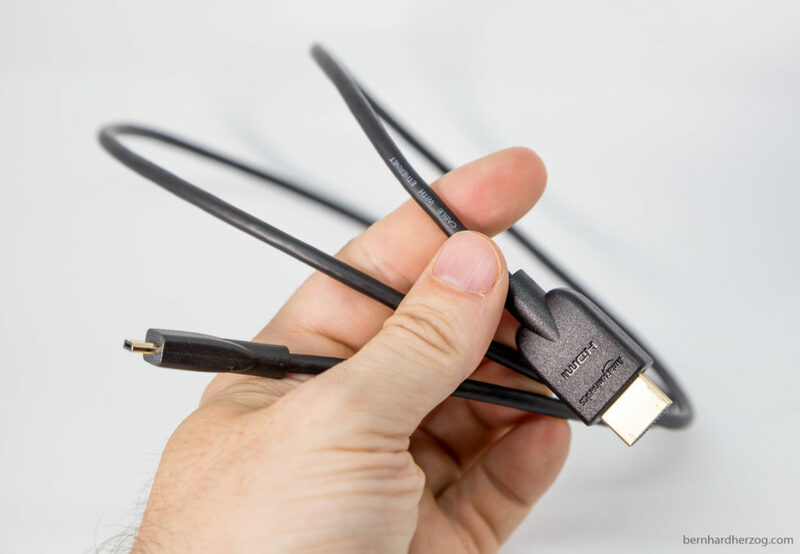 I bought the 0,91m HDMI cable from AmazonBasics. I was not sure if it is maybe too long but now I am happy with it because I use the monitor in different setups, sometimes a little bit away from the camera (like on a gimbal or when I put the monitor on the table). The Feelworld A6 already includes a battery and the cables, but I was not sure if it has the current firmware (with audio meter) so I went with the Andycine. 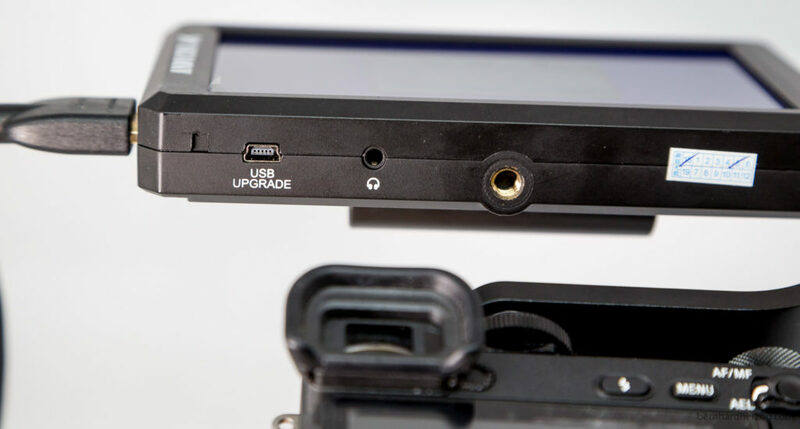 You can power the camera from the monitor if you use the dummy battery. This is an additional buy. There are batteries for some camera manufacturers. This setup works really well. 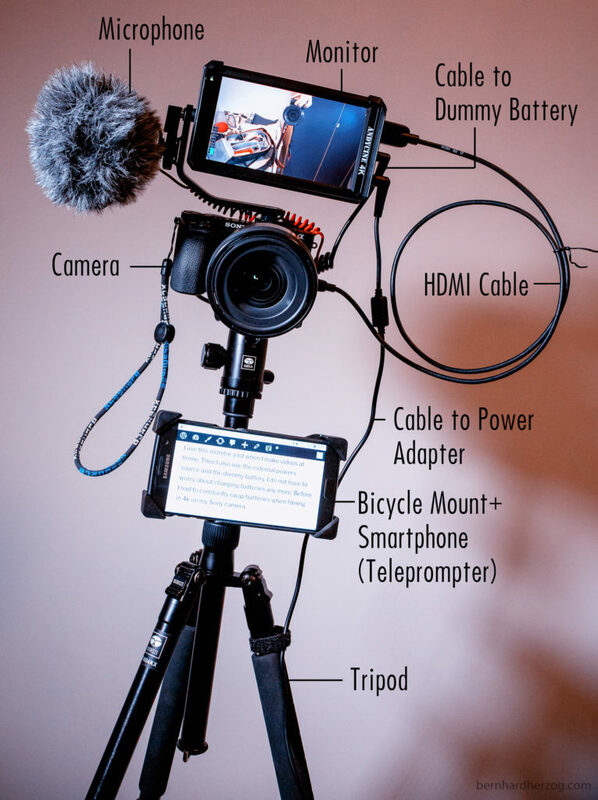 I ordered a power adapter so now I can continuously power both the monitor and the camera using the dummy battery. This is very convenient in a studio/home setup. 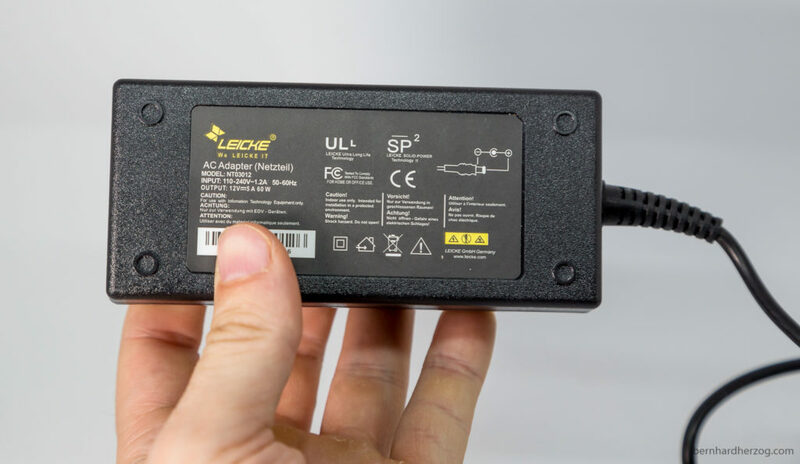 I use the Leicke 60W 12V 5A 5,5*2,5mm power adapter. Note that the 5A exceed the recommended value of 1-2A. The monitor gets quite hot but until now everything is still working. This power adapter also works with my Neewer LED lights. Be warned though, if you want to be sure that the monitor does not explode one day buy the (more expensive) power adapter from Andycine. Because the monitor is mounted on the right side with the bracket it is not 100% level. You can see this if you look at pictures of the monitor mounted or in many reviews. But in reality it does not matter to me. 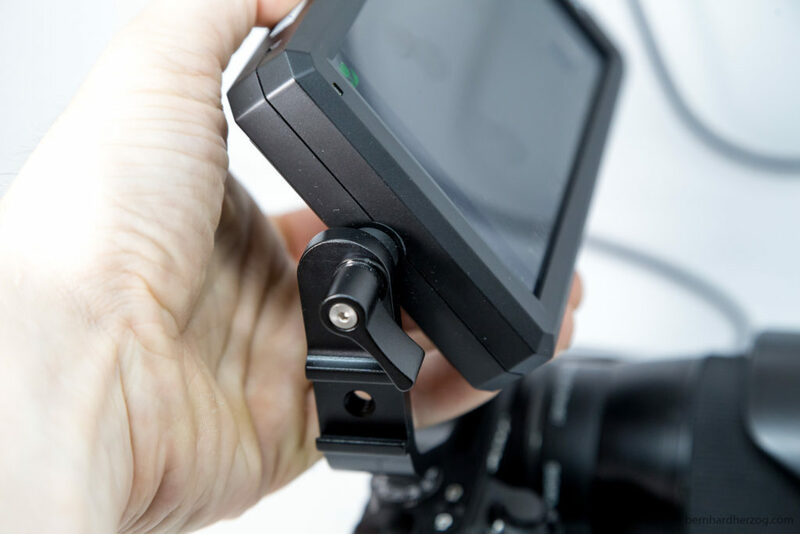 The mounting on the cold shoe is not stiff, there is a little bit of play (probably because of the electronic contacts it is not possible to push the bracket all the way to the back of the hot shoe). Again not really a problem for me but something that could be improved. I use this monitor a lot when I make videos at home. Then I also use the external power adapter and the dummy battery. I do not have to worry about changing batteries any more. Before I had to constantly swap batteries when filming in 4k on my Sony camera. For run and gun situations like outside when I have to constantly switch between taking pictures and making videos the monitor is overkill. There is usually not enough time to mount the monitor on the camera. It is different when I can plan the shoot myself. Then I can set up the monitor on my gimbal etc. and it helps a lot to have better quality footage with everything I want in focus. 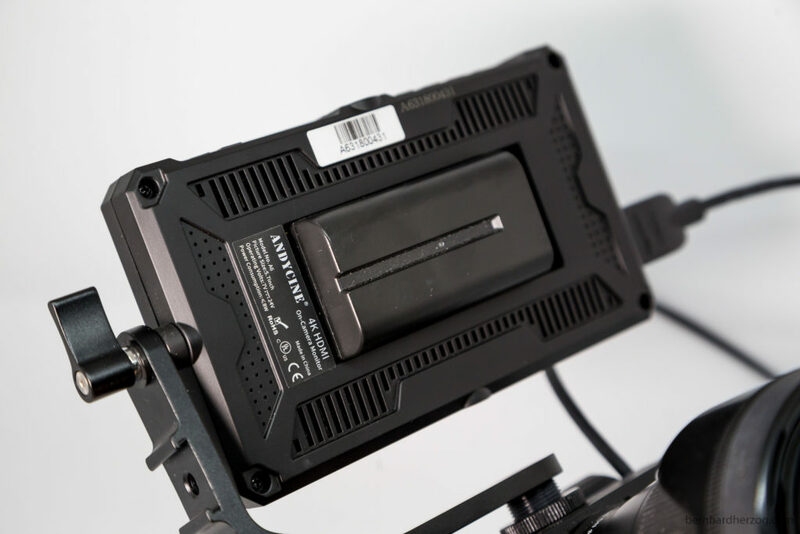 The monitor is very lightweight and easy to carry. I also use it on travels when I want to review my photos. I can quickly see if pictures are blurry and delete them. I can really recommend this monitor. It has a good price and is a great value. With my Sony camera I cannot live without it. It saves a lot of time. I remember when I was blindly shooting myself just to learn when reviewing the video that my framing was poor and I had to redo it a dozen times. If you have any question about or experience with the monitor please comment below I appreciate it. If you want to buy please use the following links. I will receive a small kickback for my efforts from anything you buy from these links without additional costs for you. THANK YOU! Great post, you answered so many questions i had. I Was wondering how long the small batteries power the monitor for? and how long the medium batteries power it for? Thanks mate! This is a very good question, I don’t have data for this right now. On amazon one guy wrote he could power it for 4 hours (2,5 hours if powering the a6500 as well ), I guess it is the medium sized battery. The problem is that the battery meter is not really exact.